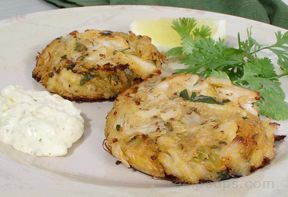 In a large bowl, combine crab meat, 1/4 cup bread crumbs, 1 slightly beaten egg, mayonnaise, Worcestershire sauce, salt, pepper and 3 tablespoons fresh cilantro. Form mixture into patties. Beat 2 eggs. Place eggs in a shallow pan or plate. Pour 1/4 cup of bread crumbs onto a plate. Dip each patty into beaten egg, covering both sides, and then cover with bread crumbs. Add 1 to 2 tablespoons of oil to a large skillet. Over medium high heat, cook patties for approximately 3 to 4 minutes on each side. Serve hot. Garnish with fresh lime wedges and cilantro sprigs.